Infant massage, the baby blues, husbands, pacifiers, lack of sleep, etc... As a new mom, it's easy to be overwhelmed by the so-called “new normal.” Still, a universal desire of new mothers is to love and nurture the wonderful new human beings that are born to them. 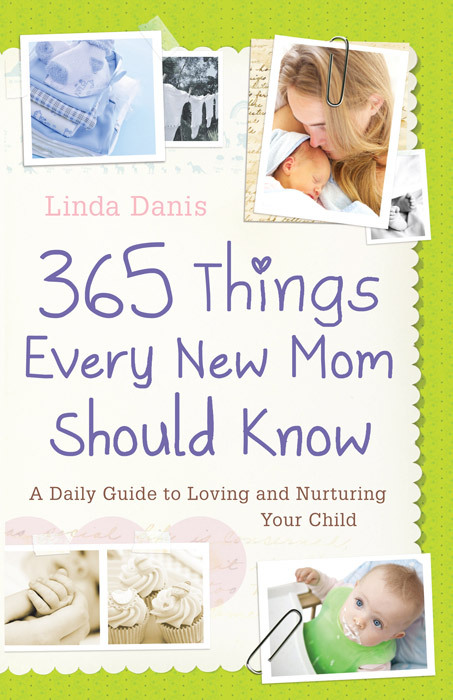 In 365 Things Every New Mom Should Know, Linda Danis offers daily inspiration on how to love and nurture your child whether you are struggling or thriving in your new role as a mommy. I actually received 365 Things Every New Mom Should Know by Linda Danis about two months after the birth of my first child. Therefore, I read the suggestions for days one through sixty-five during feeding sessions and started with the daily readings on day sixty-six. As of this writing, I'm only on day eighty-six, but wanted to go ahead and give my review in a timely manner. The suggestions in 365 Things Every New Mom Should Know are quick to read and very practical. Each one probably takes less than a minute to read with the exception of the end of the week devotional and that probably takes five minutes or so. (Clearly the author knows the value and scarcity of a new mother's free time!) The author gives some great tips. Some I already knew and some I didn't. Some of my favorite ideas are when she gives poems that include hand motions to do. I loved the motions for the Itsy-Bitsy-Spider! So cute and Baby does seem intrigued by it. In my opinion, 365 Things Every New Mom Should Know is a blend of practical ideas to nurture a child and spiritual refreshment for new moms. I absolutely would recommend this book to any new mom, whether it's their first, second, third or any subsequent child! It would also make a nice baby shower gift. Click here to visit the FIRST Wild Card Blog Tour for 365 Things Every New Mom Should Know by Linda Danis and to read an excerpt from the book. Disclosure of Material Connection: I received this book free from the publisher as part of the FIRST Wild Card Tour. I was not required to write a positive review. The opinions I have expressed are my own. I am disclosing this in accordance with the Federal Trade Commission’s 16 CFR, Part 255: "Guides Concerning the Use of Endorsements and Testimonials in Advertising."